General Election 2017, from the point of view of a partial and prejudiced observer. When the election was called, way back whenever, we were full of gloom and misery, sure that the country was about to be doomed to another five years of Tory rule and to the total annihilation of the Labour party. I have loved the idea of Jeremy Corbyn being Prime Minister since he was elected leader (we watched the leadership result on holiday, in our little rented house in Seahouses while my in-laws wondered why on earth we were watching something so boring with such excitement), but reluctantly come to admit lately that this is unlikely. Maybe people have become so used to the world as it is, a world of Trump and Theresa and Tories, that the idea of someone who actually wants to make things better for ordinary people is just too weird. Maybe people genuinely don’t realise that there is enough money, it’s just that those at the top don’t like to share it and that “trickle-down economics” rarely ends up actually trickling down. Or maybe Beloved Husband and others are right, and he really just messed up his initial contact with the press and the public and the Brexit remain campaign, messed up so badly that he can’t come back from it. 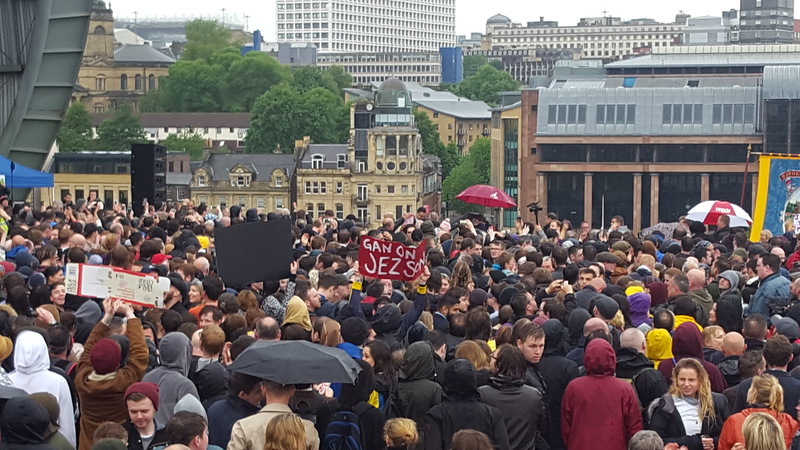 This is a tiny fraction of the crowd, thousands and thousands of people, at the Sage, Gateshead, for a rally. We were there, with our friends and our kids, in the pouring rain, for three hours. We were there to listen to him and some local Labour candidates, and it was not just inspiring but dangerously, dangerously hopeful. Even though we knew he could not win, we began to wonder what it would be like if he did. Don’t get me wrong, I’m still a Green, but this is a national emergency. We need Labour to make gains. And we waited for the exit polls. Last time, we heard the exit polls with disbelief and horror, but clung to a faint desperate hope that they were terribly wrong, that we couldn’t possibly have been stupid enough, as a country, to not only vote the Tories back in, but to give them a majority so that whatever fetters the Lib Dems had provided would be removed. By the time we packed the children off to school last May, and the results showed the exit polls to have been wrong, yes, but underestimating the Tory victory, we were sunk into a mire of gloom from which we took days, even weeks, to escape. So this time, we were determined to brace ourselves, not to build ourselves up for any happy news, and then we couldn’t fall too far. After all, we’ve proved the British can’t be trusted with a vote – this is the country that voted for a dog to win Britain’s Got Talent. Even with the climb in the polls, the most hopeful poll gave us a hung parliament and frankly even that was laughably optimistic. The exit polls said a hung parliament. I had been intending to pass the time between results by reading or catching up on some study; the books were pushed aside, and we spent the next hour or so in earnest debate with each other, with twitter (my God, with twitter – I think I spent almost the next 20 hours on twitter, surely that’s some kind of record?) and with the television as experts scratched their heads, looked at how wrong the exit poll could be (not very, defended John Curtice) and gasped at the plummeting pound. We watched it all, we were there for every seat won, lost or recounted. We saw things settle down as the first few North-East seats came in and they were Labour, yes of course, but with a swing to the Conservatives. Phew, they thought, everything will be fine, the poll was wrong. God, we thought, it’ll be awful after all, the poll was wrong. John Curtice said, well, we knew there’d be a swing here, the North-East voted strongly for Brexit (and on behalf of my NE neighbours, I do apologise), but maybe the poll was a little out. It wasn’t. 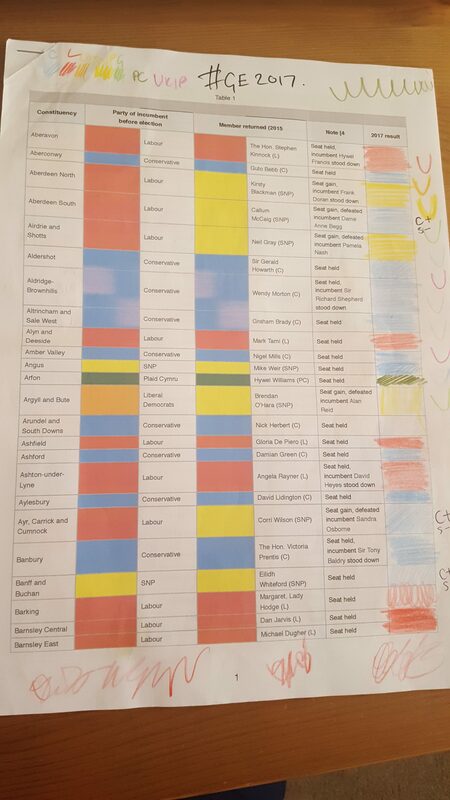 My little, rough clumsy tracker showed Conservative losses, SNP losses, but for the first fifty results or so, no Labour losses and a few wins. It was amazing. I have never been so energised by something that wasn’t in the end as good it could have been, but felt like a joyful, triumphant victory. The moments that stand out for me: Stockton South. It’s been a Tory seat for years, a blue pebble in a puddle of red. At first it was prematurely declared Conservative again (not officially), then after a recount came the news that the Labour MP, a GP dismayed at the state of the NHS, had won it had me off my seat. One beautiful moment – around 2am, the bookies’ odds changed so that for the first time, [probably] EVER, Jeremy Corbyn was the favourite to be the next Prime Minister. Last time, we complained that the turnout was so low, the Tories won, yes, but with only a third of the eligible country actually voting for them. This time, we can’t really complain at the turnout but we still didn’t win…BUT. Look at how many seats are now marginal. LOOK. Someone did a calculation, that to win just over another 60 seats, enough for a majority government however tiny, Labour just needed 2500 more votes in various seats. Hastings and Rye. Richmond Park. We were so close to major scalps there. Forty six votes in Richmond Park, and it would have been bye-bye Zac Goldsmith. Corbyn could have been PM now. But. May is Prime Minister again, but for how long? She seemed blissfully unaware in her (eventual) speech that she had lost her majority. The one she NEEDED to go ahead with Brexit talks. The one she was DEFINITELY going to get, because she was strong and stable and they were the only party competent enough to lead us through the storm of Brexit. It’s not a storm now, it could be Armageddon. Over 52% of the country voted Not-Tory. At least half of her MPs don’t want her. She is clinging on by her fingernails, she cannot last long and she is now no more than a puppet being torn apart by its various crazy puppet-masters (the DUP, anyone??! ).